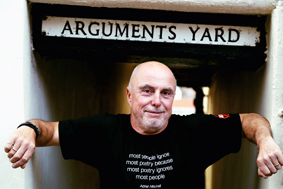 PUNK poet Attila the Stockbroker has been a ranting spokesperson for the left side of politics for more than 30 years, but says he is not downhearted by recent events. “I don’t do depression,” he insists while discussing the Brexit vote and the civil war raging inside the Labour Party. Attila is heading for Guildford’s Boileroom on Thursday (14 July) to play a benefit gig for the Red Cross Refugee Appeal, organised by Guildford Labour Party. Although he maintains a brave face, he does admit: “I’ve never been in a more polarised and sinister Britain than we’re in now. The right-wing lunatics in charge are destroying everything my parents fought for – and the right-wing press scapegoats immigrants for it. “We have no freedom of the press in this country. We have the freedom of millionaires to force their view on to everyone else. People choose to believe this rubbish. I don’t patronise them by saying people are brainwashed – they choose to believe it. What keeps him going, says Attila, is regularly playing gigs like the benefit show he’s about to play at the Boileroom. “It means I constantly meet wonderful, kind people wherever I go,” he says. “I love my job and I’m constantly meeting people with the same sort of values as I have, so I never get downhearted. “People say to me ‘it’s brilliant to hear what you’re saying’. I get wonderful comments all the time. The man behind poems like Asylum Seeking Daleks, New World Order Rap, Poison Pensioner, Russians In The DHSS and UK Gin Dependence Party says he is looking forward to returning to the Boileroom. However, he has been in Surrey recently in his other role as a keen cyclist – he recently completed a three-day charity ride to Brussels. “I visited Guildford recently when I cycled up the Beeching line,” he recalls. “I love it. I’ve been cycling a lot for about 20 years. I follow a beer and cycling diet. Attila the Stockbroker will be joined by Grainne Maguire and Steve Gribbin at Stand Up For Labour at the Boileroom, Guildford, on Thursday (14 July).